JC is a very young man. I am old enough to be his father. The very thought freaks me out. FREAKS ME OUT. JC is renovating/restoring a house in Canada. The house is quite simple, so simple that, when JC purchased it, it was difficult to appreciate WHY he would have purchased it. But love is never rational. In his blog, JC has steadily worked magic throughout the house, and what was not very interesting has become interesting (and attractive) due to the myriad talents of this young man. And JC is nothing if not talented. He is an experienced carpenter, cabinet maker, upholsterer, restorer of old clocks — and more! — and all this at the tender, tender age of thirty-one. Thirty-one! It thrills me knowing that there are young people with such interests, devotions, and skills. It makes me believe that humanity has a chance of survival. 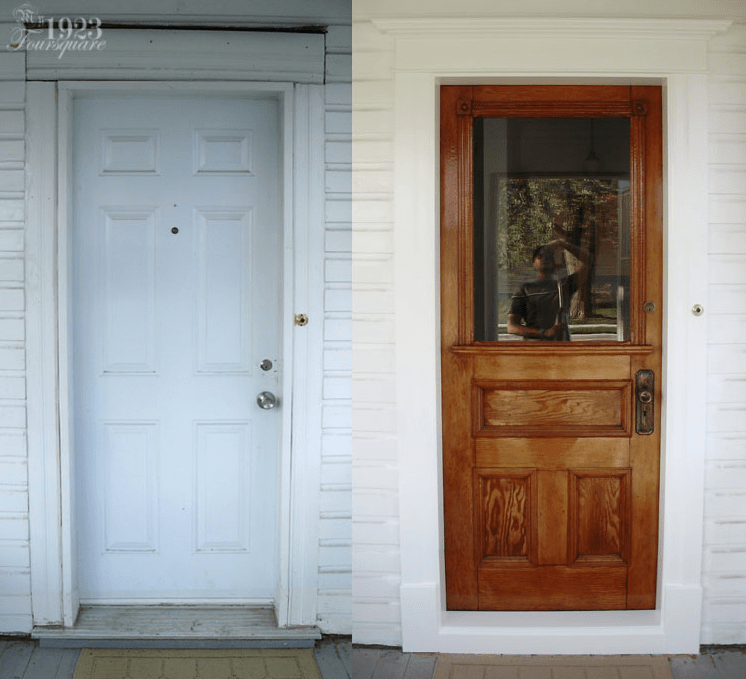 Below, is a recent Before/After of JC’s front door. Yep, ya’ just gotta love the guy. Too delicious. You can find JC’s blog here. Enjoy! Awwww shucks! If it makes you feel any better, I’ll be 32 in about a week! Thanks for the kind words Ross! But as you will be turning a year older, so will I! Sigh! I really like the before and after shots. But what I especially like about the “after” shot is that you can see the photographer in the reflection in the door. Very cool shot.